When it comes to children, the heart of each of us starts to soften. It is difficult to raise them up, but it is wonderful looking at their angel face while playing. No one wishes bad things to them. However, the disease does not ask for any wishes. It is hard to face an ill child, especially when it has to do with his mind. It is also a hard decision to start drugs to your little sweetheart, but when antipsychotics are a must, they have to be administered, especially, when it comes to schizophrenia. Actually, the use of atypical antipsychotics has been broadened enough to include other psychotic disorders such behavior and conduct symptoms or/and affective and bipolar disorders. As for any other drug, there are side effects for antipsychotics too. 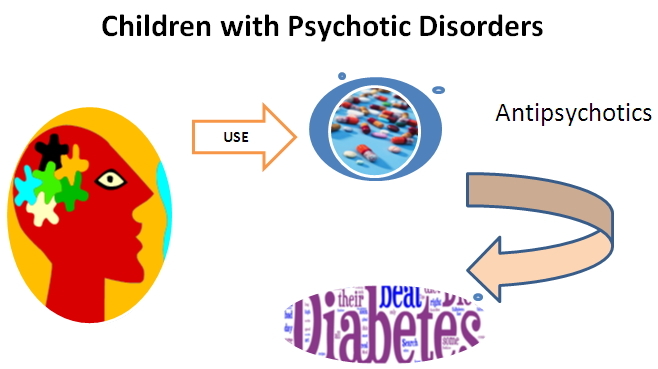 That’s why researchers have studied the role of antipsychotic meds in children’s metabolism to ensure the effect on blood glucose, and consequently, to diabetes onset. In fact, the research database provides studies that have shown a relationship between the use of such drugs and the metabolic problems in young population. To date, weight gain, insulin resistance and high blood sugar levels were strongly associated with the use of these medications. Remarkably, in this new study, the researchers found that children under 18 years old had tripled the chance to get type 2 diabetes as compared to children receiving other psychotropic medications for the same symptoms. This study (from the Tennessee Medicaid program, years 1996 to 2007) included 28,858 children using atypical antipsychotics for first time together with other 14,429 others using psychotropic drugs (control group). The most common antipsychotic drugs prescribed were risperidone, aripiprazole, quetiapine, olanzapine, and chlorpromazine equivalents. Other psychotropic drugs used included lithium, psychostimulants, benzodiazepines, antidepressants and α-agonists (control group). Kids are included in the vulnerable population, i.e. their metabolism rate is still high due to maturing process. This could explain why children could develop diabetes much easier than any other age-groups. Therefore, the recommendations of these study researchers included close monitoring of children taking these drugs for possible metabolic effects (such as diabetes). In addition, their use should be limited to the most appropriate indication of using “the lowest dose in the shortest time”, said Dr.Ray, the principal study investigator. At the end, decision is made by both doctor and patient's parents (you) depending on the actual health conditions of your kid.